Scenario of Life: Another Pace In The Journey Of Life! Another Pace In The Journey Of Life! It’s the 6th day of New Year today and this is going to be my first post of 2018. I hope you all are enjoying your new year! Here we go again. Another year is closed and another blank page is rolled out in front of us, and it’s the time to take this as an opportunity to write a new chapter of life, and of course, a time to say goodbye to our past and pave the way for our future. Nonetheless, it appears to me that my 2017 has gone rapidly, it seems like I had recently celebrated 2017. But yeah, it’s a year that has passed never to return. So, how you have given the farewell to 2017? How you have celebrated your new year? If you ask me, I would say, like every other year, this year also I had a small New Year party at my home. We have a joint family in which there are 16 members including 9 youngsters (siblings and cousins), so it’s always a fun to celebrate an occasion/festival with all of them and basically, having just a small party with them means a lot. According to me, the best happiness comes to you when you share few laughs with your near and dear ones i.e your family and your close friends. Although I won’t lie, those New Year’s Eve parties seem fascinating and I am not trying to bash on anyone who goes to those parties. Even I would like to attend one someday in future. So yeah, we had a small party at our home that started late evening. We played games, had food, and bought gifts for everyone (it was like a little 'Happy New Year' gift). At 11:59 p.m., we began the countdown and at approx 12 midnight, we had fireworks and shouted for joy. Following that, we cut the cake, cheered with everyone and gave New Year’s greetings and family hugs. And before I forget, we danced until 2 a.m. and took pictures together. Overall, we had quality family time. Next day, on New Year’s Day, we went to the temple as always and worshiped and prayed to the Lord. So, this is how we welcomed our 2018 in our own way. Although the past year was quite a rollercoaster, I had to find a new job because the firm where I was working had got notice and would probably be closed down, my mom had an operation, and there was a death in the family and so on. On the other hand, we had got awesome news pertaining to my dad's employment; there was a marriage in the family, I had started this blog and some other great things have happened too. 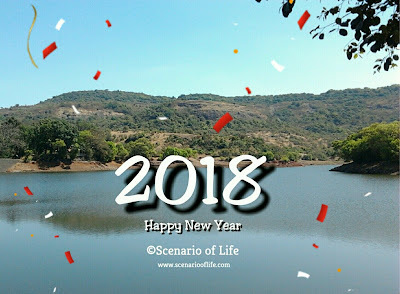 As I aforementioned I had started Scenario of Life last year and it’s been 4 months now. There has been a huge learning curve that was to be expected as a newbie. I didn’t know anything about blogging before I started this blog. But now, I can say I have created a space, a website that reflects me. Scenario of Life has become a part of me and it has certainly helped me become more outspoken and given me the chance to voice my opinion. Of course, it could use some tweaks here and there, but all in all, I love it and I am proud of what I have created. My work is being recognized and this blog has been awarded for 12 times last year. I am so thankful for all of you and for the previous year, that has taught me so many valuable lessons. The previous year has taught me that if you want something or if you want to do something then you have to dive in. Overall, it has been a year of hope and thankfulness. 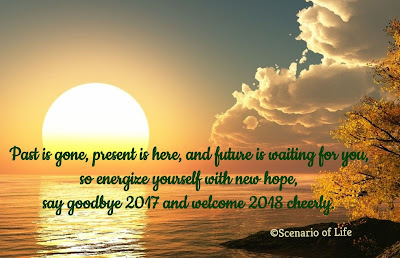 Now, I am looking forward to 2018 and what it brings. For me, this will be the year of being more positive and the year of making more dreams comes true. As they say - “Optimism is the faith that leads to achievement. Nothing can be done without hope and confidence.” So, in addition to the above, this will be the year of being more confident too and of being the better version of myself. I hope this year illuminate our life in every aspect. How was your new year’s celebration? How did you celebrate? Did you make any New Year resolution? Or if you have a word for the year, let me know in the comment section below. I would love to hear. New Year's Eve was super chilled. At home, in Edinburgh, quite romantic. 2017 was a roller coaster to me too but I am intending on making 2018 amazing! Even though, you had a roller coaster last year, I know it made you tough and learned a lot. We had cold NYE and was able to visit Niagara Falls, but it's just a 5-min visit :D Wishing you a great 2018! Great post it seems as though many of us have had a roller coaster ride in 2017! but you seem to have a fab attitude for 2018 I wish you well. Happy New Year to you Preeti. Just like you 2017 was a roller coaster and I am looking forward to a successful 2018 and beyond. Good luck to both of us. It sure sounds like 2017 was very up and down, but remember; everything happens for a reason and makes you who you are. All the best for 2018! Sounds like you had a fun new years eve with your family. All the best in 2018! Cheers to making dreams come true. I'm looking forward to working hard and seeing what 2018 will have in store for me. I just hope it's more good then bad. Congratulations on your first post for 2018! I know 2018 will be a good year for you. Keep up the good work! Happy News Years to you! I hope that your 2018 is one filled with blessings, love & success! Heres to a year of chasing our dreams! Indeed a roller coaster year for you, wishing you a more cheerful and happier year ahead! It looksl ike 2017 taught you a lot. That's inspiring. Happy New Years, Preeti. I also created the quality time with my family to celebrate the new year evening. We were baking �� corns and connected with families out of town. Thank God for WA internet technology. Wish you a lot of blessed time ahead. Happy new year! I hope you can accomplish your goals and continue to grow in 2018. Thanks for sharing. Cheers to a wonderful 2018! <3 I hope it's amazing for you. Happy New Year first of all. I had good time just with 1 friend only even though not exaactly planned but still. We walked around our home, played some music, ate some food . But good to see it helped you a lot. Now you have much more to do this year. This chilled new year was in blanket this year, but yes, I have made few resolutions to me, a mommy , and a major shift lies now in focusing on my soul. May you have a great year. Fortunately, or should I say, I was blessed last year with a few worries in mind and more travel. But this year Just few days ago a huge struggle has started early but hopefully it will be the last for this year. Wow, 2017 has been really good for you. Despite being a new blog, it's impressive that you won so many awards. Wish you a very Happy New Year too! Was at home right under the blanket for the chilling New Year beginning. Have fixed certain resolutions. Let me see whether I can adhere to them. Reading about your ups and downs of the year make me sigh and know that we really do have so many good and bad things happen to us all the time. You sound very optimistic in magnifying the good things and making good opportunities for your life. Very inspirational. So glad to hear that you celebrate with family and friends and are looking forward to the new year. I hate being away from my children nye that's why I flew back from Iceland. We all actually went out this year too. Happy New Year Preeti. I definitely am very positive about 2018 and so happy to see so many others pumped up about 2018. We watched the ball dropping down in New York Times Square, on the TV. Happy New Year. I hope that 2018 would be a much better than 2017. Wow! Four months is huge. Congratulations and keep moving forward. That's so awesome. Congratulations on so many amazing accomplishments in 2017! I am sure this year will be full of even greater things! 2017 gaves me an amazing year and i look forward that 2018 will be more better. Am excited so much!